A Black man from Waldorf Maryland went on to social media a few days ago and made threats to kill ‘white people’ in La Plata, Maryland. Hollins was arrested by the La Plata police and is facing charges for threats of mass violence, police said. But what about Louis Farrakhan, the leaders of ‘Black Lives Matter’ and the New Black Panthers who have made numerous similar threats to kill white people and/or police officers regardless of their race? Why are they still walking the streets after threatening to kill people? Why haven’t they been arrested? The courts have ruled that there are some limits on the First Amendment and free speech rights. You can’t yell “Fire” in a crowded movie theater. Why can you threaten to kill white people and the police with seeming impunity from the law? On July 30th of this year, At Mt. Zion Baptist Church in Miami, Louis Farrakhan called for “ten thousand fearless black men to rise up and kill those who kill us. Stalk them and kill them.” He was talking about police officers and white people. Not long after Farrakhan’s call to violence against white people and the police, on August 26th, a white female reporter and her cameraman from a Virginia TV station were murdered on live TV – stalked and killed – by a disgruntled former employee – a black racist motivated by Farrakhan and revenge for the Charleston church shooting, where a young white man killed nine black congregants. Two days later, on Aug. 28, Harris County, Texas Sheriff’s deputy Darren Goforth was murdered while pumping gas – stalked and shot in the back of the head, and then multiple times at close range while he lay dying on the ground. An unstable black man with a police record, Shannon Miles, was arrested for the crime. We all know that President Obama and the current administration are giving Farrakhan, Black Lives Matter and the New Black Panthers a wide open field with no consequences for their threats. Obama sends representatives from the White House to the funerals of thugs killed by the police, but Obama sends no White house representatives to the funerals of police officers killed by the thugs. We know by his actions whose side he is really on and it is not the police. i believe that the La Plata police department has set the example of what can be done. State, County and local law enforcement must act to protect more innocent Americans from being slaughtered by racist criminals egged on by so-called black leaders, because Obama and his administration will not prosecute them. Even the Democrat National Committee very recently passed a resolution supporting the ‘Black lives Matter’ movement. Either these democrats are ignorant of the facts, or they actively support the murder of white people in general and police officers in particular. Either way their decision is despicable. There must be serious consequences for these racist demagogues who have repeatedly threatened to kill people and have urged their followers, supporters and others to kill innocent people, including police officers. All three organizations and their leaders actively promote the killing of police officers and hide behind the false narrative of the victimization of all black people by whites. Their terrorist threats against innocent Americans, including police officers, must be answered with arrests and prosecutions at the state, county and local level. I am very well aware that some law enforcement agencies and prosecutors may not take action against these individuals and organizations for fear of being labeled as ‘racists’ or “anti-black,” or they may fear the activist demonstrations that may follow. To these agencies I say stop being politically correct. 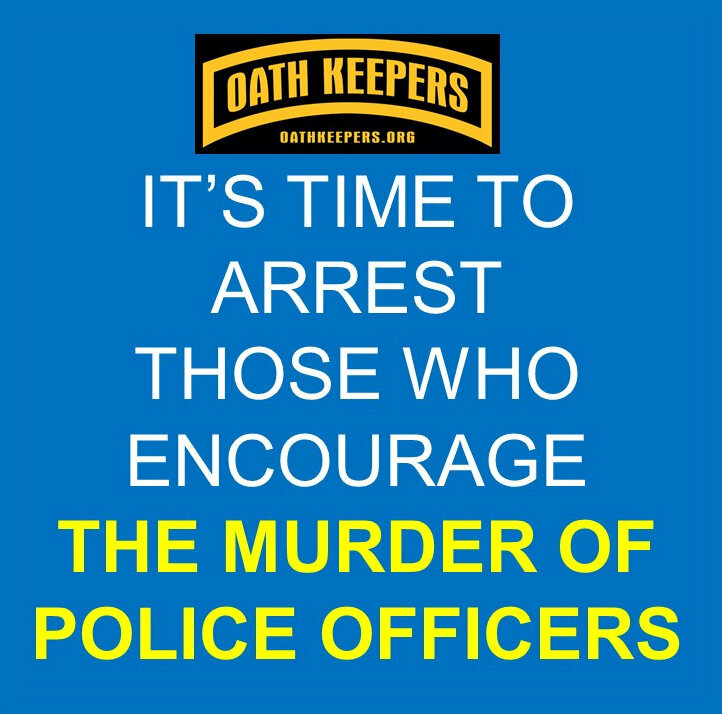 Grow a back bone and do your sworn duty to protect innocent Americans for the time ha come to arrest and prosecute those individuals and leaders of organizations who threaten to kill police officers.